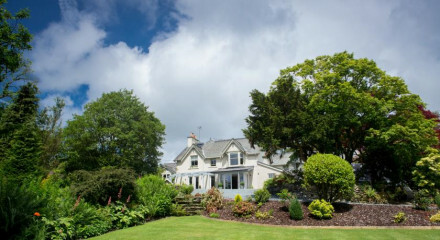 “This classic country-house hotel not only has all the expected ingredients - grand pedigree, rolling lawns, tennis and croquet, afternoon tea on the terrace, log fires - but also one of the Lake District’s finest views. 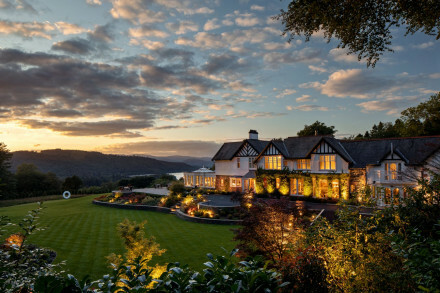 On the slopes above Lake Windermere, it gazes over both lake and fells beyond. Built as the Victorian hunting lodge of Lord Lonsdale, it retains the original Arts and Crafts details: oak floors and panelling, stained-glass panels and tiled fireplaces. Furnishings complement with William Morris-style wallpapers, brass-framed mirrors and rich-coloured sofas. Bedrooms in the main house are classically styled with pretty-patterned wallpapers, upholstered armchairs and good-size bathrooms. Rooms in the converted cottages and new-build lodge are lighter and more contemporary with large picture-windows. Although some feel less cosy, they offer more privacy, and some have hot-tubs. All rooms have lake or fell views. Walkers and ramblers bring your wellies and explore this stunning part of the country. Unwind in Victorian English style with pampering suites overlooking Lake Windermere, spa services and impeccable service. Transfer service from train and airport by car or helicopter. Miss Potter Suite and Ghyll Side cottage both feature a private hot tub. Canapés on the terrace in fine weather. Fine grounds sloping to the lake. Cottage sleeping five and is located in the grounds. Pets welcomed at a fee and with advance warning. Children of all ages welcome plus babysitting services are available on request. Unwind in the steam and sauna rooms after a health spa treatment of your choosing. Take a helicopter tour of the picturesque Lake District, a totally unique experience. Hark back to the good old days with a glass of Pimms and a relaxing game of croquet on the lawn. Ask at the front desk for an outline of the wonderful walks around the lake and beyond. Tennis courts avaliable for guests to use at their own leisure. "Inside, it's like a dream of posh, Country Living-mag rusticity, from the blazing log fire and the Parker Knoll chairs in the lobby to the woven Bergerac furniture and the biographies of Tory politicians in the sitting-room. " 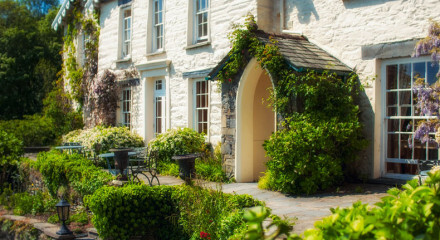 Is this the Lake District's most charming hotel? "From the canapés served in the Edwardian sitting room to the series of artfully presented dishes in the panelled dining room, it was a seamless ride." Great views of Lake Windermere.